Mollie introduces Bridge Publications. Mollie on setting up Bridge Publications following Mr. David Miscavige’s vision to create the top digital publishing facility in the world. Mr. David Miscavige’s insistence on making things as easy as possible for the staff and to automate functions. Mr. David Miscavige came by Bridge Publications to see the staff and how the organization was working. Mr. David Miscavige has a great sense of humor and will take Mollie out to eat after work. Working with Mr. David Miscavige is exciting, challenging and exhilarating. Mr. David Miscavige worked on getting the LRH materials, the Scripture, back to Source, its original state. Mr. David Miscavige’s encouraging Mollie by insisting that she be as great and successful as she can be. Mr. David Miscavige cared for Mollie, her family, seeing to her health. So this is Bridge Publications. It is the publishing arm of the Church of Scientology International. Bridge Publications services all of the Americas, it services Australia, New Zealand, Oceania and South Africa. It has a sister corporation which is New Era Publications in Copenhagen, Denmark, and New Era services all of the United Kingdom and it services all of Europe. And together, Bridge and New Era, as our publishing arm, they publish all of the works of L. Ron Hubbard. All the materials of Dianetics and Scientology: every book, every recorded lecture, in every format, hard cover, paperback, all our compact discs, DVD material, every course pack, everything that any parishioner uses as a book and a lecture to study L. Ron Hubbard and his works is produced at Bridge. I was privileged to be part of a group of staff that were handed this task by Mr. Miscavige when he said, “We’ve got to set up a publishing facility. We’ve got to be able to bring all of LRH’s materials. We’ve got to be able to do it on…at any time, any quantity, all languages, et cetera.” And he put us onto an apprenticeship. We studied L. Ron Hubbard’s organizational technology, and obviously using his study technology, and we got the bedrock of, okay, how do you organize something, how do you put a production line in place? What does that mean? So with that foundation, then we went ahead and started researching digital printers, color, digital color printers. We partnered with, you know, some of the top companies in the world—Xerox, HP—and really figured out, here’s what we need to get done, what do those industries have? You know, what is the equipment, what type of thing. We had to research and really create and come up with a proposal of this is what we want to do. We had to come up with a plan and really work with those companies to see how would this work, what did we want to do. And that’s printing equipment, it’s binding equipment, the whole…the entire compact disc production line for all the three thousand recorded lectures. So we had to learn about all of this. And so when you take L. Ron Hubbard’s policy on how to study something and how to organize something and then you take Mr. Miscavige’s brilliance at realizing Mr. Hubbard’s vision, and then you partner with, you know, the top, top, top industries in the world, I mean, you get something that you…we never even imagined in the first place. Mr. Miscavige imagined it and then, you know, we realized it. And you get what we have today which is a digital publishing facility unlike any other in the world, and all for one author. I mean when we first started there was a lot of, you know, hand labor, there was a lot of individual labor. And things that we were a bit—you know, that’s fine, the staff don’t mind doing it and so on and, you know, we could always organize whatever we wanted to organize. But he was absolutely insistent that we make things as easy as possible. Thumb notching—literally, which we used to do by han—you know, how does Random House thumb notch? Well, they have a lot of people that sit there and thumb notch. So our sister company in New Era had devised a machine to do automatic thumb notching. And you know, at one point we’d decided we don’t need those, it’s fine, we’ll just handle it. And in one of his visits he was like, “Why the hell are we doing this? Of course you need the automatic thumb notchers.” And he went around to the staff checking it out and just saw that it was absolutely a nightmare. So we got in the thumb notchers. And he came again once they were here to see that they were installed, that the staff were using them, how was it going, were they hatted on it, did they know what they were doing, and so on. Other times, even in the beginning—how do we dust jacket, how do we—just anything, when we were getting up and going on something, he was hands-on on that—how does it work? What do we have to do? How do we refine that? Okay, we don’t have it quite yet, let’s figure this part out. And here in the shop with us figuring out how to do it, in any of our formative stages. And then as we got good at things or whatever, he’d come by just to say hi to the staff. Like, you know, fist-pump the receptionist and—you know what I mean? And say hello to the crew and see it. Once we had a new line up and running he’d come by and…just to see how it was working. And it…I mean it made everything worthwhile when he’d come through to do that. What’s it like working with him? He's…his sense of humor is incomparable. He has an amazing smile. He is…he enjoys a good laugh. He's exceptionally and maybe abnormally normal. He likes a great taco truck. We’ll sit down and have a grilled cheese sandwich together. Like, it’s as normal as you can…as you can conceive of, with an exceptionally amazing individual. And what it's like working with him, is like working with—you know, we'll wrap something up for the day, and it’s, you know, get a taco, or it’s, you know, sit down for a cheeseburger, or whatever. Working for Mr. Miscavige—and I’ve been privileged to work directly with him for about, for almost ten years on the various dissemination projects that the Church has been involved in. Working with him is fast, it’s exciting, it’s challenging and exhilarating. Like, the things that we do are things that we never thought we would do. 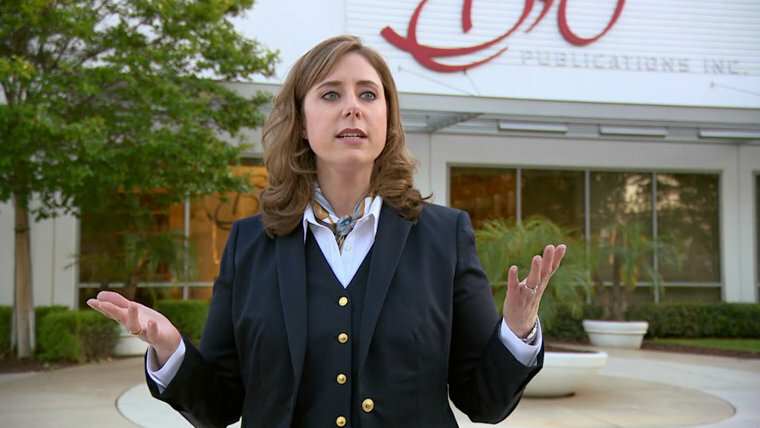 What you see at Bridge today, what we have at Bridge today is the realization of LRH’s dream at being able to make, you know, his technologies of Dianetics and Scientology available to everyone, coupled with Mr. Miscavige’s vision of how to do that today, how to do that in our world today. Mr. Miscavige sees you and he sees you for what you...he knows what you can do, he knows you...who you are personally and he knows what you can do. And that’s how he operates with anyone he works with. That’s how he operates with me. He has always seen more in me than I have seen in myself. And he has always insisted of me that I’m as great and as successful as I can be. And that has run the gamut from so many things. It’s run the gamut from apprenticeship and training and mentoring on, you know particular projects. But it’s run the gamut to personally seeing to my health, when it needed to be personally seen to. It has seen to asking about my family and how my, how my mother is doing. It has seen to, sending, you know, pies when my hometown football team wins the championship. It has seen to so many different things that...you know, he is my, you know, my superior, he is our chairman, he is our leader, but he is also, you know, he is the greatest friend that you could ever hope to have. You gonna want, you want him, he has your back and you know he has your back and everything that you're gonna try and accomplish and succeed at, you... if you’re doing it with him, you’re going to succeed.